Xiaomi, one of the world's leading smartphone makers, is hoping to raise more than $6 billion by selling shares for a stock market listing in Hong Kong next month. The Chinese tech firm announced the planned value of the listing Saturday. It's less than the $10 billion Xiaomi was reportedly hoping to achieve a few weeks ago, but would still make it the world's biggest initial public offering (IPO) in nearly two years. "In the future, Xiaomi has huge potential for growth," CEO Lei Jun said at a news conference in Hong Kong. "We're a very rare company that can do hardware, e-commerce and internet services." Xiaomi said it's aiming to sell almost 2.2 billion shares to global investors this week for between 17 and 22 Hong Kong dollars each ($2.20 to $2.80). 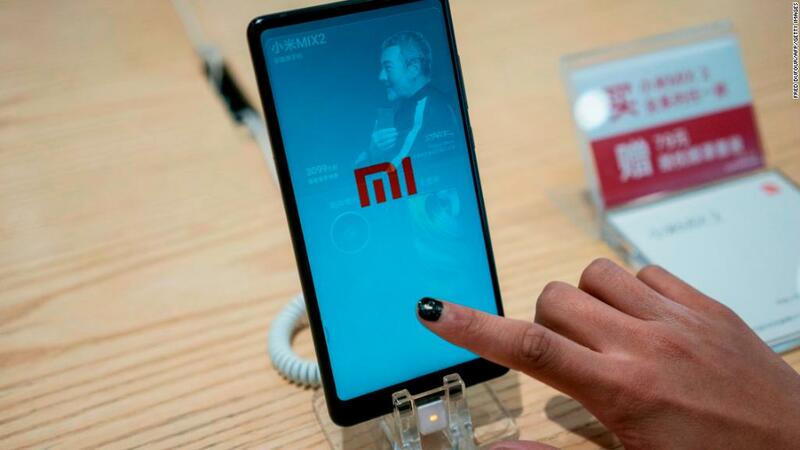 James Paradise, an Asia-Pacific president at Goldman Sachs (FADXX), which is one of the IPO's sponsors, said Saturday that the range values Xiaomi between $54 billion and $70 billion. That's lower than the valuation of close to $100 billion the company was reportedly seeking earlier this year. "We never said how much we were valued," CFO Chew Shou Zi said at the news conference. "In the last several months, the market had a lot of speculation." Hao Hong, chief strategist at Hong Kong-based broker BOCOM International, said one explanation for the lower valuation was that investors were concerned about Xiaomi's potential to increase its profit margins in the future. "The explosion of Xiaomi has been at the low end of the market. It's not taking the premium end of the market like Apple (AAPL) and Samsung (SSNLF). That's why its profit margins are very difficult to expand," he said. Trading in Xiaomi shares on the Hong Kong stock exchange is expected to start on July 9. The company plans to use the cash from the IPO to increase its research and development and for global expansion. The listing is also expected to make some of the tech company's cofounders and early employees extremely wealthy. In a recent filing, Xiaomi said it had awarded Lei, the CEO and cofounder, stock worth about $1.5 billion for his contributions to the company. Xiaomi defended the huge award on Saturday, saying it's a common practice. "We reached a consensus to make the decision because of Lei's devotion over the last eight years, he started the company from scratch," said Xiaomi President Lin Bin, another cofounder. Xiaomi had also planned to simultaneously list shares in mainland China in addition to Hong Kong but will now only go public in the latter. The company said it planned to revisit the possibility of a listing in mainland China at a later date. The company's IPO will be the biggest in the world since Postal Savings Bank of China went public in September 2016, according to data provider Dealogic. A wave of other huge Chinese tech companies are also reportedly considering going public in the next year, including online payments giant Ant Financial. Founded in 2010, Xiaomi was the fifth biggest smartphone maker in the world last year, shipping more than 92 million devices, according to research firm IDC. Xiaomi's main business is phones, but it also makes a range of other internet-connected devices, including laptops and even smart rice cookers. The company says it sells its products in 74 countries and regions. It has enjoyed particularly strong growth in India, where it has overtaken Samsung as the biggest selling smartphone maker. It is also currently the fourth largest smartphone company in Europe, behind Samsung, Apple and Chinese rival Huawei, according to research firms IDC and Canalys. It's competing strongly in Spain, Greece and Russia. Documents that Xiaomi it published last month showed that revenue soared nearly 70% last year to around 115 billion yuan ($18 billion). Operating profit more than tripled to 12 billion yuan ($1.9 billion). Xiaomi made headlines in 2014 when it became the world's most valuable startup. But the company then ran into trouble, suffering a drop in smartphone sales in 2016 as it struggled with supply chain problems. -- Sherisse Pham and Julia Horowitz contributed to this report.